August | 2014 | Children Are Our Future Now! From Plantogram.com comes this healthy alternative to the junk down the snacks isles for your kids and you! 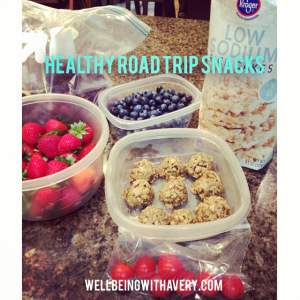 With school starting up, it’s great to have easy, healthy after school snacks for your kids. Try this recipe for a fun way to serve your kids fruits and yogurt. You can also substitute yogurt for ice cream to make the snacks a delicious dessert! Well, today was the day! Today was the day I picked up and moved from Nashville, TN to St. Louis, MO. It’s crazy and exciting and just a tad bit nerve-wrecking. Tomorrow I move into my dorm room and start a crazy adventure of four years as a nutrition and dietetics school. I’m pursuing my passion in an academic sense, and I couldn’t be more excited! As you may know from reading previous posts, I try really hard to stay healthy with my eating and exercise habits while traveling and while out-of-town. Today was no exception, except that I’m not really traveling—I keep having to remind myself that I’m here to stay! 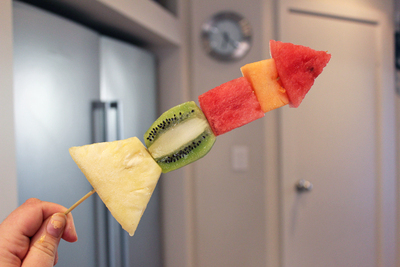 This fruit rocket ship doubles as a craft and then a snack! Before you get started you can get your kids to design their rocket ships. You’ll be doing most of the cutting, so this is a great way to get them involved. They’ll need to have a point at one end, and a base at the other end. Get them to use colored pencils that match the fruits you have available. Start by cutting and peeling the fruit. You’ll need one piece of fruit in a triangular shape for the tip, and another in a trapezoid with the bottom wider than the top. The other bits of fruit can be rectangular or square. Try not to make your fruit too thick or too thin. You don’t want it too heavy for the skewer, but you don’t want it to break off either. 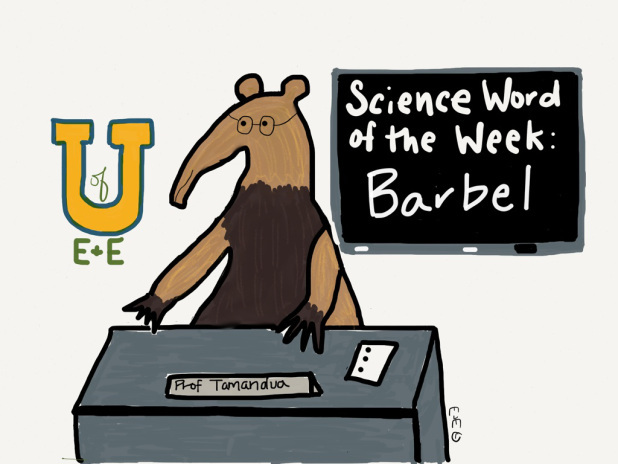 It’s Monday and that means it time for our Science Word of the Week! We’re celebrating Shark Week and tomorrow I hope everyone will be wearing grey tomorrow for International Elephant Day! We want to see your support for elephants! Today we’re talking about a body part that fish have for our Science Word! Barbels: a barbel is a finger-like projection on or near the mouth or near the nostrils of certain fish species. Barbels are sensing projections and some have taste buds. They help fish like catfish, hagfish or sturgeon. 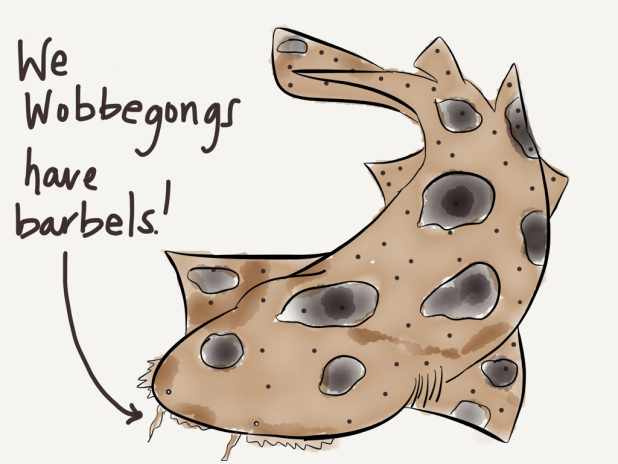 Another fish that has barbels is the Wobbegong Shark! They use their barbels to detect prey on the bottom of the ocean floor.